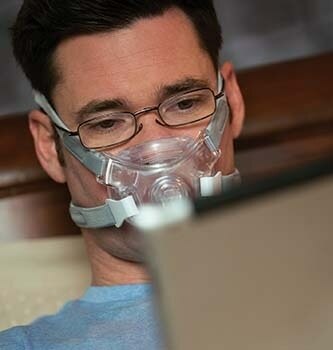 The Amara View is a minimal contact CPAP mask that was designed with the widest field of vision of any full face mask. Due to it's innovative under the nose design the Amara View reduces the red marks and irritation on the bridge of your nose. The Amara View makes it easy to wear glasses, read, watch TV or use a tablet before turning in for the night. 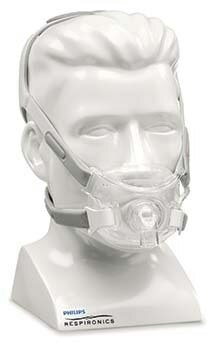 Philips Respironics offers this new innovative mask to make CPAP therapy as natural as possible. No bulky cushion in front of your face. Measuring for the correct cushion size could not be easier with the Amara View. Using the simple sizing gauge all you have to do is measure the depth of the nose. Available sizes include small, medium and large. Loosen headgear to a large setting, then grip and twist the headgear clips away from the frame to disconnect. Hold the mask against your face. Place the mask under your nose and over the cushion nostril opening. Push the mash cushion up. Pull the mask over yout head. Press the headgear clips into place to connect to mask. Pull back the tabs on the headgear to evenly adjust the top and bottom straps. Pull back the tab to adjust the crown strap. Connect your CPAP tubing to the AMara View's quick release tube. Amara View Minimal Contact Full Face Mask Discounts Apply ! The Amara View’s incredible under-the-nose design makes it the only full face mask that won’t cause red marks on the bridge of your nose when compared to other Full Face Masks. Amara View is also the smallest, lightest and has the widest field of vision of all leading full face masks. 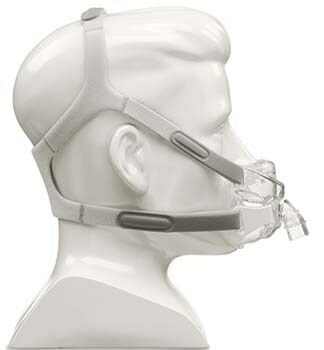 The Amara View covers less of a patient’s face than all leading full face masks. It’s easy to wear glasses, read, watch TV, and use a computer or tablet before falling asleep.